A nice paper HERE by Björn Brembs, Katherine Button and Marcus Munafò called "Deep impact: unintended consequences of journal rank". Go download it. Most researchers acknowledge an intrinsic hierarchy in the scholarly journals (“journal rank”) that they submit their work to, and adjust not only their submission but also their reading strategies accordingly. On the other hand, much has been written about the negative effects of institutionalizing journal rank as an impact measure. So far, contributions to the debate concerning the limitations of journal rank as a scientific impact assessment tool have either lacked data, or relied on only a few studies. In this review, we present the most recent and pertinent data on the consequences of our current scholarly communication system with respect to various measures of scientific quality (such as utility/citations, methodological soundness, expert ratings or retractions). These data corroborate previous hypotheses: using journal rank as an assessment tool is bad scientific practice. Moreover, the data lead us to argue that any journal rank (not only the currently-favored Impact Factor) would have this negative impact. Therefore, we suggest that abandoning journals altogether, in favor of a library-based scholarly communication system, will ultimately be necessary. This new system will use modern information technology to vastly improve the filter, sort and discovery functions of the current journal system. While at this point it seems impossible to quantify the relative contributions of the different factors influencing the reliability of scientific publications, the current empirical literature on the effects of journal rank provides evidence supporting the following four conclusions: (1) journal rank is a weak to moderate predictor of utility and perceived importance; (2) journal rank is a moderate to strong predictor of both intentional and unintentional scientific unreliability; (3) journal rank is expensive, delays science and frustrates researchers; and, (4) journal rank as established by IF violates even the most basic scientific standards, but predicts subjective judgments of journal quality. 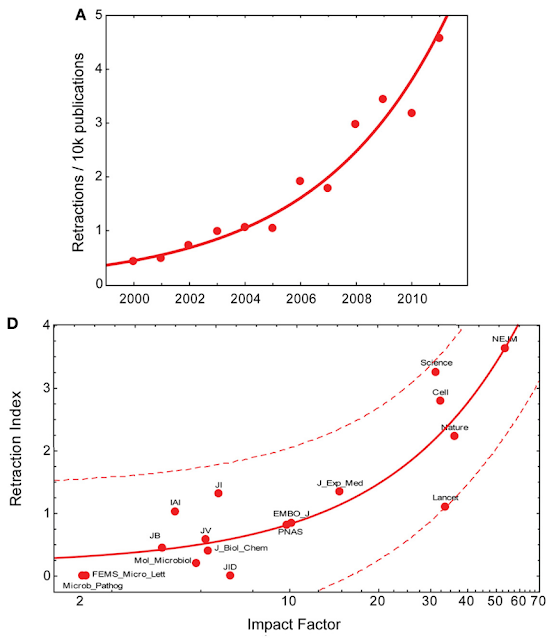 The following Figure from their paper shows (A) Exponential fit for PubMed retraction notices (data from pmretract.heroku.com) and (D) Linear regression with confidence intervals between Impact Factor and Retraction Index (data provided by Fang and Casadevall, 2011).